We think of our brains as single, unified organs. 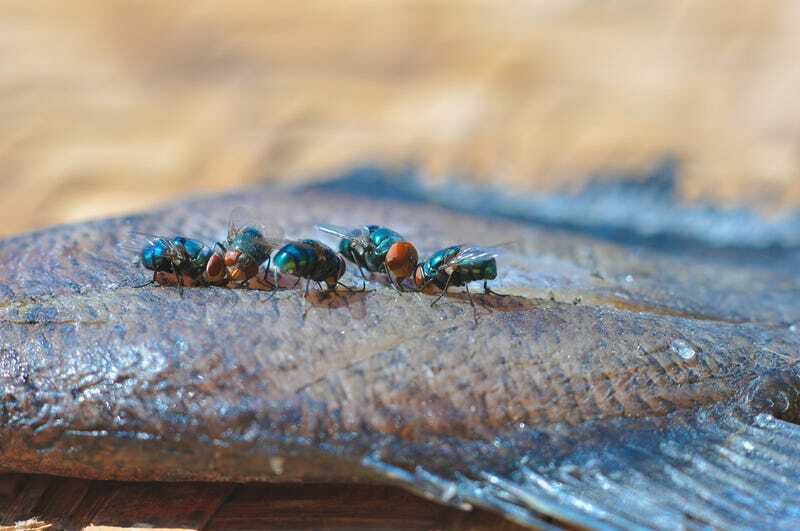 But a new set of experiments with flies reveals that certain brain cells in these insects respond exclusively to crowd behavior. And that leads to an interesting question: Did cells in the animal brain evolve to think using something akin to the wisdom of fly swarms? Over at Not Exactly Rocket Science, Ed Yong talks about these experiments and their implications. Through a impressive series of experiments, involving a smorgasbord of cutting-edge techniques, [Pavan] Ramdya showed that flies can collectively flee from a bad smell faster than any individual can by itself. Alone, each fly is only slightly repelled by the odour; together, they run away decisively. Even mutant flies that can't smell the odour at all can escape if they're in the presence of smell-sensitive peers. "It's a scenario familiar to any big city dweller," says Leslie Vosshall from Rockefeller University, who studies the senses and nervous systems of insects. "Pushy crowds respond to bad things differently than individual people, because information can flow through the group that compels it to act. It turns out flies are exactly like people in this regard." During these experiments, Ramdya isolated a series of neurons, or nerve cells, that are responsible for the flies' crowd behavior. These neurons in the flies' brains are triggered by light touches on the insects' legs. That's because flies in a crowd communicate messages like "run away form the bad smell" by brushing up against each other. So you might say that Ramdya and his team isolated a group of crowd-sensing neurons. Ramdya and his team found that they could guide individual flies by duplicating the light touches that triggered the crowd neurons. Just nudging the fly had no effect. They had to precisely trigger those exact neurons using an instrument that created a very localized, gentle touch. A similar process goes on in your head. The 86 billion neurons in the human brain are individually unthinking, and interact with their neighbours according to very simple rules. But together, they can land machines on passing comets, craft works of astonishing beauty, and even unravel the collective behaviours of other creatures. Put more humbly, the operations of your brain may be no more impressive than a swarm of flies.